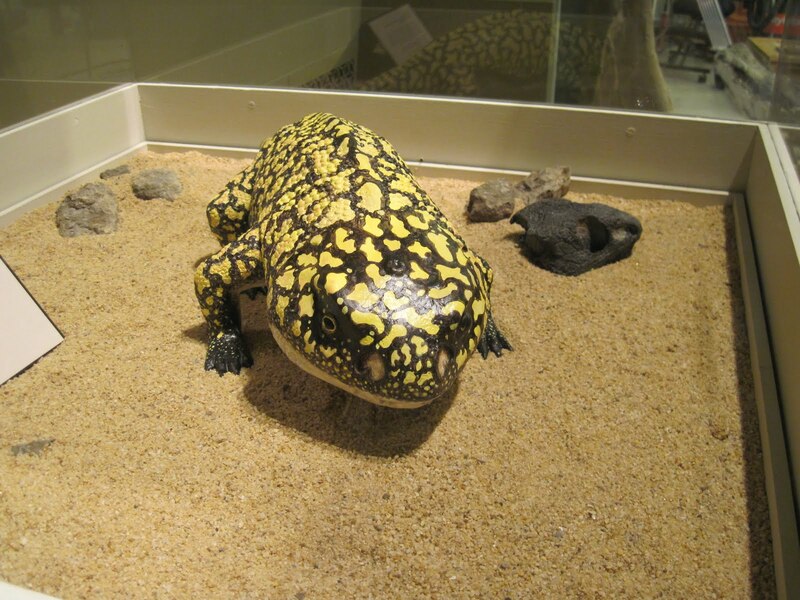 The trematopid amphibian Fedexia, the mascot for this year’s Society of Vertebrate Paleontology meeting, greeted us at the welcome reception at the Carnegie. 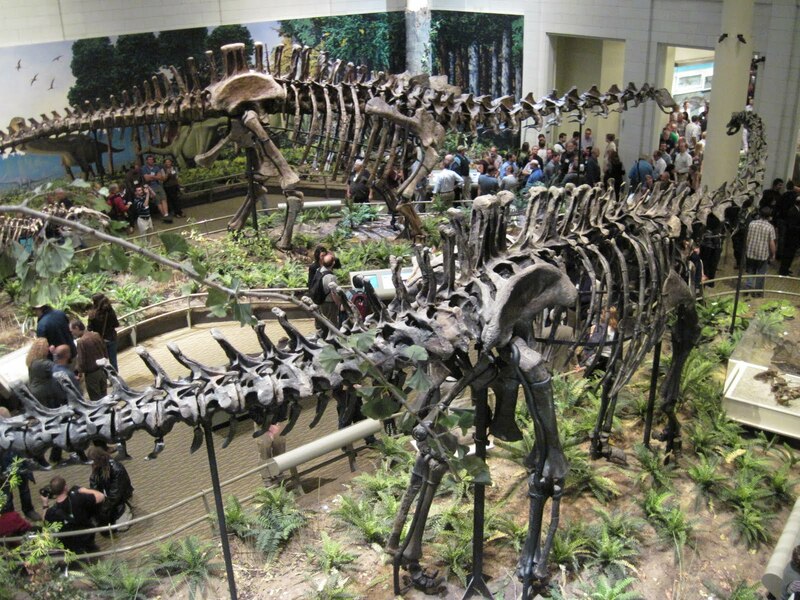 The Carnegie recently renovated their dinosaur hall, now called “Dinosaurs in Their Time”. 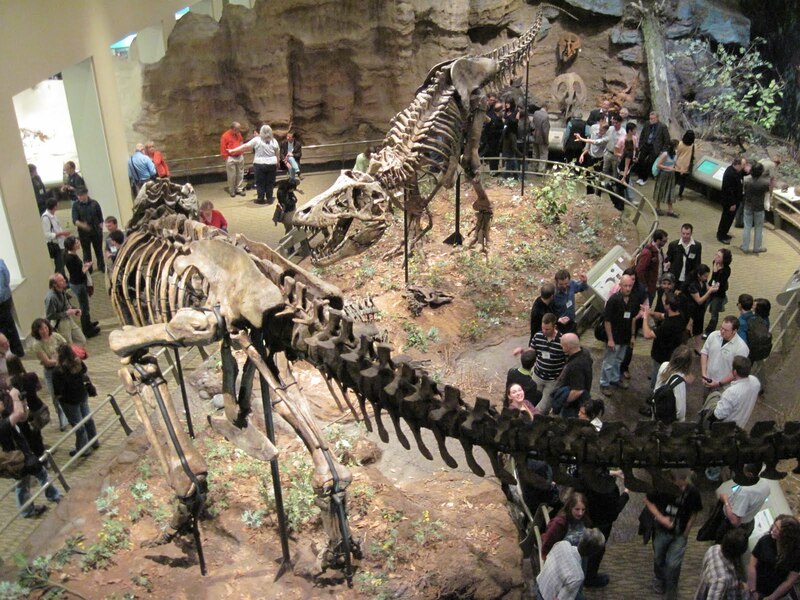 It features exhibits of Triassic, Jurassic, and Cretaceous terrestrial faunas, and a small marine exhibit. My favourite was the Jurassic Hall featuring both an Apatosaurus (in the back) and Diplodocus (in the front) having a staring contest. The Jurassic Hall also has a Stegosaurus, Allosaurus, Camptosaurus, and some great small specimens like the little crocodilian Hoplosuchus and the skull of the enigmatic theropod Marshosaurus. The Cretaceous Hall was also quite impressive, with not one but TWO Tyrannosaurus squabbling over a poor dead hadrosaur. There were also exhibits on early mammals and feathered dinosaurs. The Welcome Reception is always one of the highlights of the SVP meeting, and I think everyone had a great time. I’ll post up some pictures of the Auction and After-Party later this week. Apatosaurus neural spines certainly are elevated over the sacral area. Bakker said that enabled sauropods to rear up for high browsing.